This image from the Indian city of Shravanabelagola (about 160 km km from Bangalore), is from cotaro70‘s photostream. The city is home to an enormous late 10th-century statue of statue of Gomma?e?vara Bahubali. Bahubali, who is said to have meditated motionless in a standing position for a year, is a revered figure in Jainism, and the site is an important Jain pilgrimage center. Nandi the bull is the mount of the Hindu god Shiva. I took this photo at the Asian Art Museum, where, unfortunately, the bull is less prominently displayed than it was at the museum’s old location in Golden Gate Park. 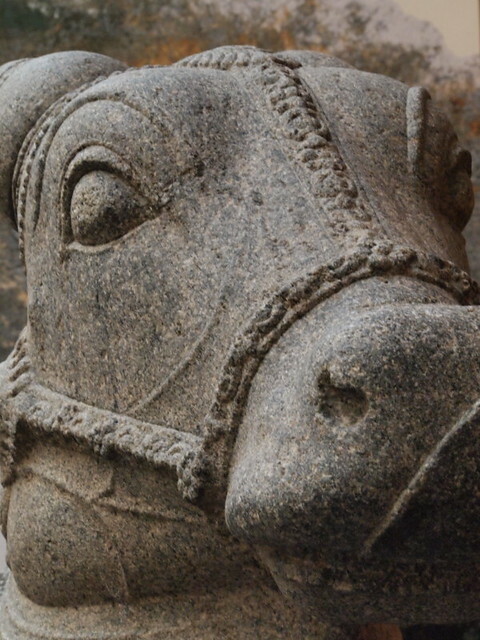 In southern India, a large sculpture of Nandi would usually be placed in front of the main sanctuary of a temple to Shiva. It would face toward the sanctuary, so that Nandi could gaze adoringly at the representation of his master enshrined there. Because of this orientation, worshippers entering the temple compound would approach the sculpture of Nandi from behind. Here Shiva’s bull is decked with garlands, strings of bells, an elaborate blanket, and other decorations carved in the stone. In the temple, it would also have been wreathed in real flowers and fabrics. Still, Nandi remains much beloved, and this massive statue 15th-century granite statue is readily accessible in the museum’s south court, where it is well worth a visit. Kew Gardens and the British Museum have teamed up on a project called Indian Summer that sounds very cool. Kew has … installed a special Indian garden in the museum’s forecourt. Designed by Kew horticulturalists Steve Ruddy and Richard Wilford, “India Landscape” transforms 440 square meters of lawn into a concise overview of the Indian subcontinent’s three main habitats: the Himalayan Mountains, the temperate woodlands of the Himalayan foothills and the humid subtropical lowlands. The Himalayas are conjured up with a vertical rock garden, surrounded by pine trees and cranesbill. The temperate zone includes a Himalayan walnut tree and a blue poppy, one of the world’s truly blue flowers. The subtropical regions come to life thanks to a lotus filled pond, and a mature banyan tree. The winding path, in the shadow of the British Museum’s neoclassical façade, has a dense but spacious quality, and the gardeners have somehow managed to create a sense of north-south travel as we make our way from barren rocks to the spidery lushness of the banyan. Garden and Cosmos: the Royal Paintings of Jodhpur, May 28 to August 23. India Landscape, May 2 to September 28, British Museum forecourt, free. Yesterday the Portland Art Museum unveiled a recent purchase: an eleventh-century stone Ganesha from northeastern India. The Portland Ganesha is shown seated in the posture of “royal ease,” with one knee raised. His rat mount looks up from below, a wisdom bearer (vidyadhara) reaches down from above with a garland of flowers. One of Ganesha’s hands is held in the gesture of reassurance, while the others hold various objects. How was this object removed from India? No one seems sure. Here’s another great Ganesha from the Walters Art Museum in Baltimor. This one was made in Bihar in the eleventh century, during the Pala dynasty. The material is muscovite biotite schist. Gift of J. Gilman d’Arcy Paul, 1967, 25.49. Indian painting is hot these days. Francis Newton Souza’s Birth (oil on board, 48 x 96 in., 1955), shown above, recently sold for $2,487,931 at an auction at Christie’s London, a record price for modern Indian art. Souza spent much of his life in London and is the only Indian artist to have a room dedicated to his works at Tate Britain. He was born on April 12, 1924, in Saligaon, Goa, India and died on March 28, 2002 , in Bombay, India. His website is maintained by his estate. This image of the Taj Mahal, the mausoleum constructed by the Mughal Emperor Shah Jahan in the seventeenth century, is from Stuck in Customs‘s photostream. This photo of a bride bedecked and bejeweled for her wedding is from riceFR’s photostream. Here’s an interesting dancing Ganesha for comparison with the one from the Asian Art Museum shown at right. Both works are from the tenth century. This one, now in the State Archaeology Museum of India, comes from Padhawal, Morena. The Ganeshas wear similar crowns, are surrounded by similar implements, and hold similar poses. The most obvious difference is in the positions of the legs. While the Asian Art Museum Ganesha leans at a jaunty sideways angle, this one is coiled in a complicated, dynamic pose, his weight more centered. Ganesha is generally considered to be the son of Shiva and Parvati. There are several stories of how he got his elephant head. Most commonly, it is said that he was beheaded by Shiva, who then in remorse replaced his head with that of an elephant. Despite his stocky form and big belly, Ganesha often dances. He is carefree and cheerful, yet he is also a patron of scholars and students. It is not difficult to image lively music inspiring this Ganesha to dance. charming collection of popular Ganesha images.